Dr. Suess said it best with Oh The Places You’ll Go. It’s right on the money. There are so many different destinations, so many varied experiences. One of the best parts about motorcycling is that you are at the controls of one of the most enthralling forms of personal transportation… like… ever! With the Joe Rocket Ballistic Adventure Jacket, the go anywhere ethos is on full display. Constructed of a water resistant RockTex 600 outer shell and reinforced in the shoulders and elbows with a burly 840D ballistic nylon, this jacket is ready should you happen to take a spill. At the same time, you will be given the added benefit of CE-approved armor in the shoulders and elbows, as well as the option to upgrade the back protector if you so choose. For more functionality, a 2-stage waterproof/insulated, full-sleeve liner is zipped in and can easily be removed should the road take you through multiple conditions with regard to temperature and precipitation. Additional thought went into not only how you will get to your destination, but also what you will need to take with you for when you arrive. With that in mind Joe Rocket has also included 3 outer pockets and 4 interior liner pockets so that you can pack a wide variety of supplies on your journey. So go where you want, live how you live, and don’t let a lack of gear hold you back. 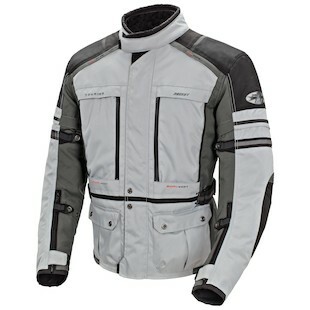 If you are the adventurous moto-type, Joe Rocket has you in mind with the new Adventure Ballistic jacket.